Cake was never a big thing in either of my parents’ houses when I was growing up. I mean it was a big thing in the sense that anytime one appeared it brought on plenty of excitement on the part of us kids, to say nothing of a creeping anxiety that we might not get our fair share (a sentiment that led to a good deal of hovering and wolfish glances towards wherever said cake had been tucked away until after dinner — always hauntingly within grasp). But these were mostly cakes that were picked up at the store or the bakery, or that a neighbor had generously delivered to our front door. When it came to actually baking a cake, none of the cooks who populated the two households I grew up in were too interested in devoting their culinary skills to anything as superfluous and time-consuming as making cake. And that has mostly been the attitude I’ve had, as well. That is until I started this cooking blog, and the need for preparing all sorts of things — not just dinner foods and sandwiches, but breakfast dishes, and all manner of desserts — grew in importance. And the thing I’ve discovered from what has now been six-months of marathon balanced cooking, is this: few things are more satisfying than baking a cake. Because no matter how easy it is to prepare a cake (and it is often very easy indeed) the end result tends to promote that kind of Wow, did I really make that? response that’s the payday for any home chef. And if all goes well and you followed the instructions correctly (not confusing the measurement for the baking soda with that for the baking powder, for instance), it’s a reaction you’ll hear echoed a short time later when that first forkful is consumed. 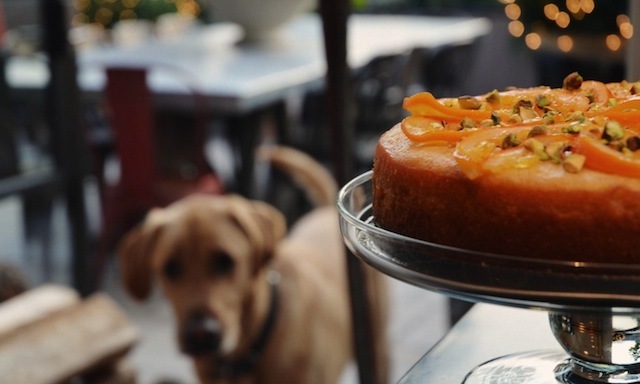 That, at least, has been my experience with the cake I bring to you here — an olive oil variety with a heavy dose of cardamom and a sprinkling of candied orange. The recipe comes from Bon Appetit and was part of a summer menu the magazine ran last June, inspired by the cooking of a region they identify as “the southern Mediterranean,” but which seems, more precisely, to be that of North Africa (grilled Tunisian flatbread, yogurt-marinated lamb, etc.). 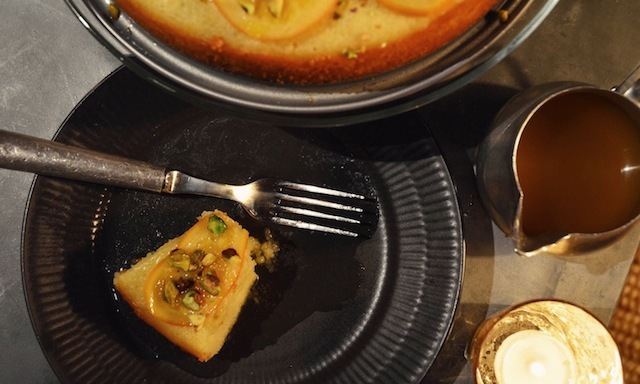 That said, given the exotic, unmistakable presence of cardamon in the recipe, it’s a dessert that would feel equally at home in Jaipur as it would in Tunis. That was my feeling, anyway, as I crushed a small handful of cardamon pods (use a meat mallet for this if you have one) and placed them in a heavy saucepan, along with a generous amount of sugar, a 10 1/2 ounce jar of orange blossom honey, and a thinly sliced orange. These are the ingredients that make up the cake’s syrup as well as its candied orange topping, and within minutes of their bubbling away together on the stovetop, the kitchen was enveloped in an exotic, perfume-y scent, heavy with the fragrance of cardamom but with seductive hints of orange, as well. It’s a duo that may well be present in some classic North African dishes but that my nose kept telling me was 100% South Asian. While I could certainly see making this in summer as BA clearly intended, something about all that candied orange and toasted pistachio, not to mention the heady fragrance of the cardamom and the intoxicating sweetness of the cake, made me think it would be better suited for the holidays. It had all the color and exuberance you look for this time of year, and it reminded me of the legend of the three wise men from the east. Yes, I know they (supposedly) came bearing gifts of gold, frankincense, and myrrh, but if they’d thought to bring a cake it would have been this one. In other words, this is something different — literally an exotic breath of fresh air in a season traditionally handed over to the drab duo of fruitcake and plum pudding (two desserts I’m still waiting to be seduced by). I’ve never been to India, much less celebrated a major holiday there, but something about the perfumed quality of this cake and the sun-soaked colors of its surface convinced me it would be a fitting end to any banquet there. 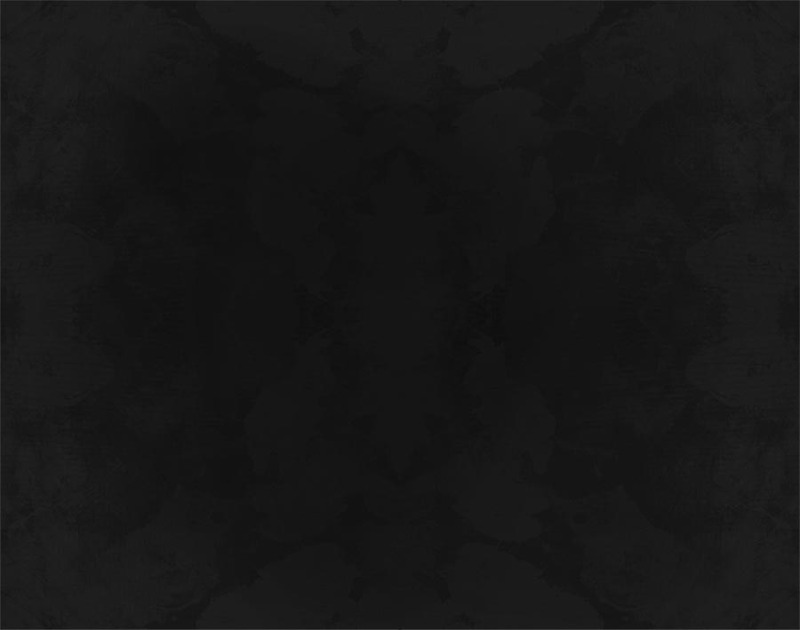 Close my eyes and I could almost hear the strumming of a Sitar… I liked that image to close out the year, and to welcome a new one. 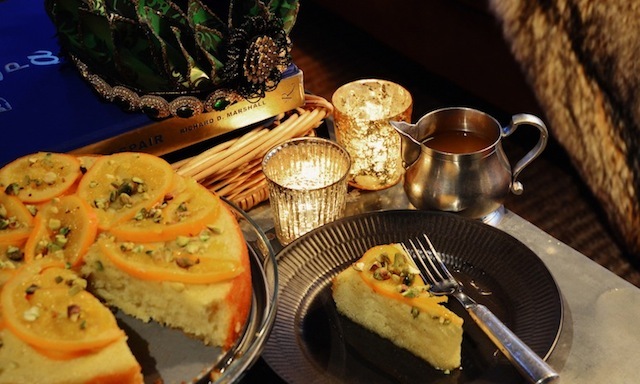 And yet, for all its Seven Veils exoticism, the cake is basically a traditional olive oil cake. 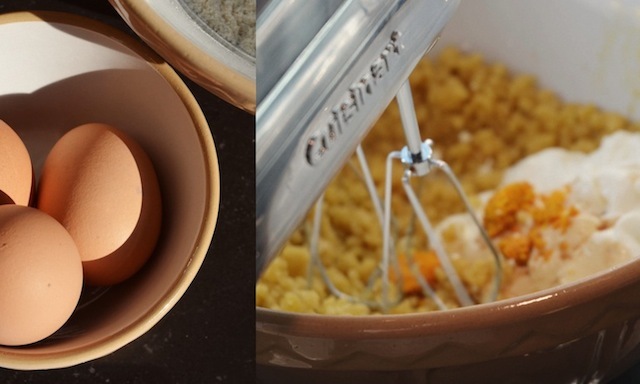 A mixture of sugar and olive oil (not extra virgin as you don’t want the flavor of the oil to overpower that of the other ingredients) is added to three beaten egg yolks, followed by a variety of dry ingredients (two kinds of flour, baking powder, ground cardamom, salt, and baking soda). Once combined you introduce a small amount of orange zest, a bit of vanilla, and 2/3 of a cup of whole-milk yogurt. This last provides the cake with a subtle tang, while also ensuring that its crumb stays small and dense — a quality further underscored by the presence of semolina flour among the dry ingredients (semolina is sturdier than the standard variety and is used to make pasta). And for air, beaten egg whites — sweetened with ¼ cup of sugar — are folded into the mixture, so the finished cake won’t just be firm and tight, but spongy, as well. Of course, that sponge-like quality is put to good use once the cake has baked for its requisite 25 minutes, as it is pierced all over with a skewer (if you don’t have one just use the end of a meat thermometer), then drizzled with ¾ cup of the syrup. That step is then repeated once the liquid has been absorbed fully (about five minutes). In other words, this is not one of those cakes that runs the risk of being dry. Nor, for that matter, is it likely to call out for further sweetening, a fact that renders the recipe’s suggestion of pouring a bit of excess syrup over each slice of cake pretty much unnecessary — it’s sweet enough (perfectly so) without this addition. 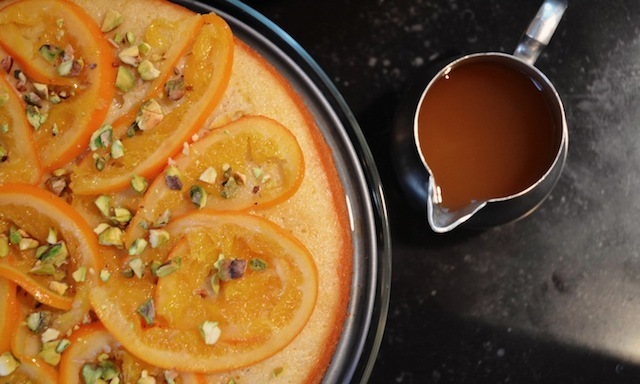 In any case, once the cake has cooled completely (four hours or so should do it), run a thin knife around the edge of the pan, unlock, and festoon the surface with your orange slices and toasted pistachios…like so many pieces of confetti. 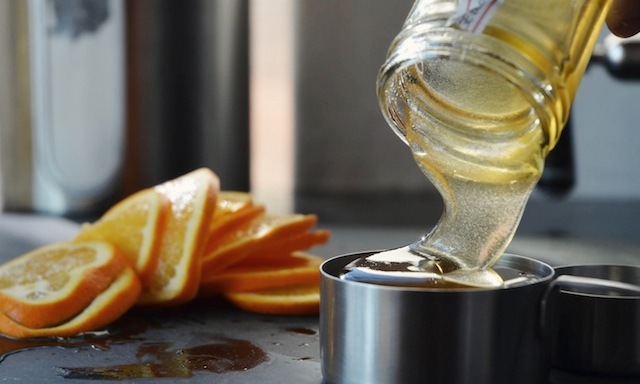 A few final notes about the topping: although the recipe instructs to “thinly slice” the orange prior to cooking, you are clearly meant to end up with intact slivers after they’ve been cooked down with the sugar and honey. Unfortunately, mine fell apart during the cooking process and I ended up with more rind than meat (though a few were still attached to small bits of orange). No worries, though — my cake still looked beautiful and after their 40 minute simmer in the company of all that sweetness, any bitterness in the rind had long since been replaced by a compulsively eatable candy-like quality. As for the pistachios, I found it easiest to chop these first, then add to a dry skillet over medium heat for a quick toasting (about five minutes, just until they darken slightly). 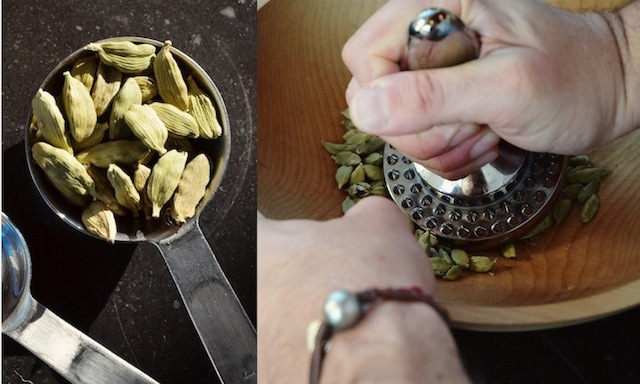 Lastly, while none of the ingredients called for here should pose much of a challenge in locating, if your market does not carry green cardamom pods, they’re easy to find through any number of on-line resources (I’ve included a link to one in the ingredients section, below). The same holds true for semolina flour, though this too is widely available, particularly at most better markets or Italian specialty stores. —Line a baking sheet with parchment paper. —Bring sugar, honey, cardamom, and 3 cups of water to a boil in a medium heavy saucepan, stirring until sugar dissolves. Add orange slices. 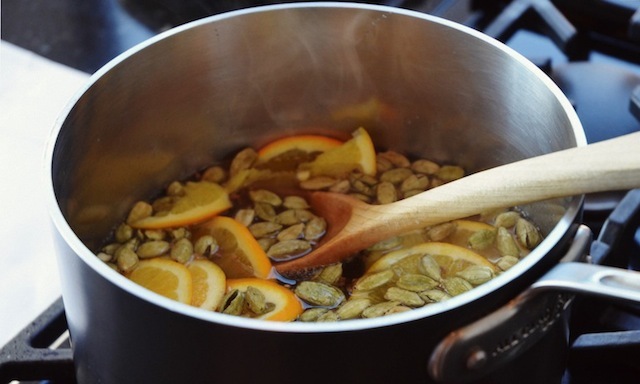 Reduce heat to medium-low; simmer, turning orange slices occasionally, until tender and syrup is reduced to 3¼ cups, about 40 minutes. 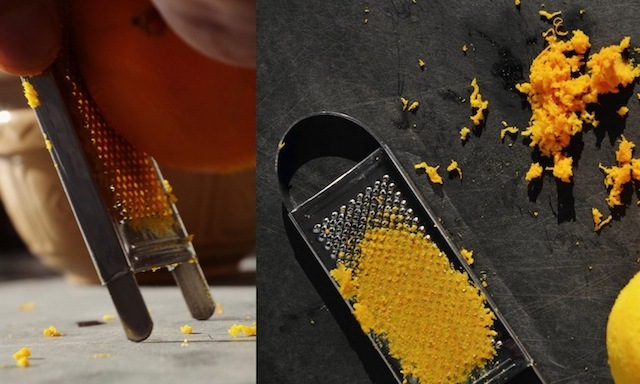 —Arrange orange slices in a single layer on prepared baking sheet; remove cardamom pods and seeds. Strain syrup and set aside. —Note: Can be made 1 day ahead. Cover syrup and orange slices separately; chill. 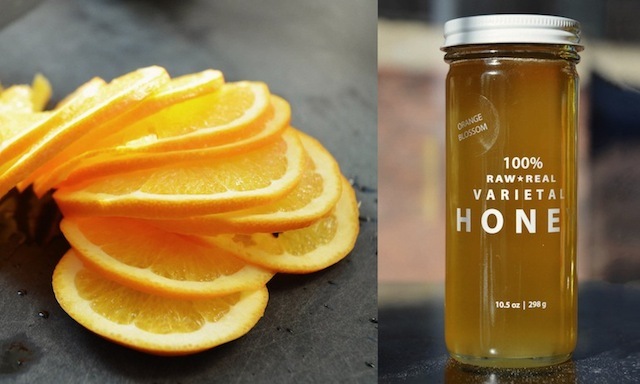 Return orange slices to room temperature and re-warm syrup slightly before using. —Preheat oven to 350 degrees. Brush pan with olive oil. Whisk both flours and next four ingredients (the baking powder, the ground cardamom, the salt, and the baking soda) in a medium bowl. Using an electric mixer, beat ¼ cup sugar and ½ cup olive oil in a large bowl for I minute. Beat in yolks, then flour mixture. Beat in yogurt, zest, and vanilla. Using clean, dry beaters, beat egg whites in another medium bowl until soft peaks form. Gradually beat in remaining ¼ cup sugar until firm peaks form. 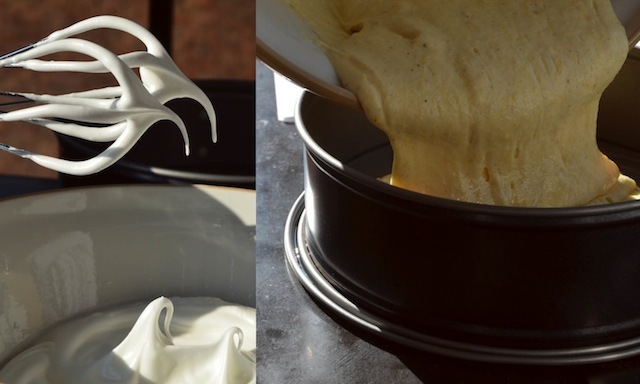 Fold egg whites into batter just to blend in two additions. Transfer to prepared pan; smooth top. —Bake cake until a toothpick inserted into center comes out clean, about 25 minutes. Pierce hot cake all over with a metal skewer. Slowly drizzle ¾ cup warm syrup all over. When syrup is absorbed, slowly pour ¾ cup more syrup over. Reserve remaining syrup for serving. Let cake cool in pan on a wire rack (about 4 hours). Run a thin knife around edge of pan to release cake. Remove pan sides. 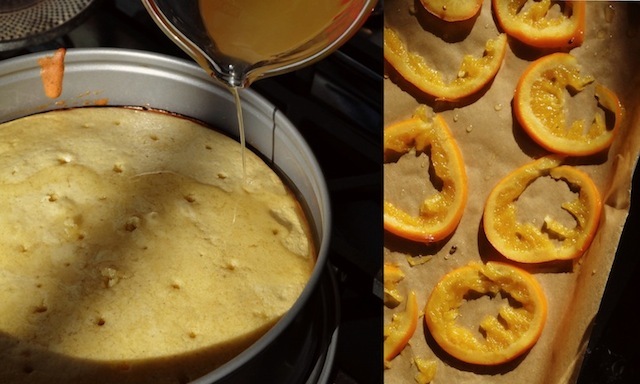 Arrange candied orange slices across top of cake. Sprinkle pistachios over top. Cut into wedges and, if you like, serve drizzled with more syrup. Serves 12.